"We're all going to be on this train for a while. We just might find out what happened before we get off." While the late director Tom Gries' filmography leans towards television series, the stars he has directed on his 13 features contains some pretty heavyweight talent: Charleton Heston (Will Penny, Number One, The Hawaiians), Raquel Welch and Burt Reynolds (100 Rifles), Bruce Dern (Number One, Will Penny), Donald Pleasance and Lee Majors (Will Penny) and Robert Duvall (Breakout, Lady Ice, The Greatest) to name a few. 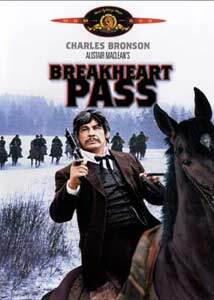 Breakheart Pass was his second effort (the first being Breakout released earlier the same year) to star Charles Bronson, who at that time was probably most famous for his role as Paul Kerskey in Michael Winner's 1974 hit Death Wish. No stranger to the western genre, Bronson helms this adaptation of Alistair McLean's (who also wrote the screenplay) novel. A train carrying medical supplies and reinforcement troups is on its way through the Rocky Mountains to Fort Humbolt, where an outbreak of dyptheria has left the strategically located camp undefended. On board is Governor Richard Fairchild (Richard Crenna) who is escorting Marcia Scoville (Jill Ireland), the daughter of the fort's commander. In charge of his troups is Major Claremont (Ed Lauter), with a preacher (Bill McKinney as Reverend Peabody) and a physician (David Huddleston as Dr. Molyneux) also along for the trip. When the train stops in a remote railroad town for wood and water, U.S. Marshall Nathan Pearce (Ben Johnson) requests to come on board, as he is to collect Levi Calhoun (Robert Tessier), a notorious criminal who is being held captive at the fort. His request is denied until John Deakin (Bronson) comes to their attention in the local saloon. Wanted for a number of crimes including theft, arson and murder, the Major conceeds to Pearce's wishes, and brings him aboard with Deakin as his prisoner. The trouble starts when two of Claremont's officers disappear before the train leaves town, but the suspicion mounts when the doctor turns up dead, with a puncture wound in his chest. As the journey continues more bodies continue to appear, and a mystery about the identity of the killer unfolds. While the train speeds towards its destination, answers are few and far between with only the knowledge that something is seriously wrong in evidence. I found Breakheart Pass to be an excellent action film, with some harrowing stunts as the train makes its way through the mountains. Bronson plays his role brilliantly, and Robert Tessier makes an excellent villian. The mystery and suspense are well handled, with plenty of twists along the way. The majesty of the Rockies is beautifully captured, the script well delivered, and the outcome satisfying. Jerry Goldsmith supplies the score, which works well with the many action sequences. We have a few fairly nasty (in a good way) special effects, which may not be suitable for the overly squeamish. I think they may have had some trouble coming up with a marketing angle for the film, as the cover art is somewhat deceptive, featuring riders on horseback and shots of Indians, which, while in the film, don't account for most of the picture. This is a western whodunit that takes place on a train, and all in all a great action adventure film. Image Transfer Review: The anamorphic 1.85:1 image is generally pretty decent, albeit a bit on the soft side and with a fair amount of grain present, though that varies from scene to scene with some worse than others. The source is fairly clean, with dirt or scratches present in only a few sections. Colors are a bit on the washed side, but considering the film's vintage hold up fairly well. Overall a pretty good presentation. The flip side has an open matte transfer, similar in quality to the widescreen image. The film's opening holds up well on both transfers, and could have been a mess due to the interference patterns used. Audio Transfer Review: The two-channel mono audio track is clean with no distortion evident. Dialogue is clear, and Jerry Goldsmith's score is adequately preserved. While perhaps not as engaging as a surround mix, for the style of film, I'm happy with the result. Extras Review: Only the film's nonanamorphic widescreen trailer is presented as an extra. It is in markedly worse shape than the feature with crackly audio and lots of damage to the video. A fine, well acted and directed western action film, though the train setting is a bit unconventional for the genre. As an Alistar MacLean story, suspense and mystery are bountiful. Some great action sequences, and an interesting plot place this one among the better films in the genre, I was very pleasantly surprised. Recommended.